Certificate verification system is a system designed to computerize the process of adding certificates and verifying the certificates records considering the problems faced by doing this manually. The system was studied and relevant officials were interviewed to acquire the required data. This designed system allows for easy retrieval of information that is accurate for effective and efficient allocations. It has easy maintenance of information as well as time saving and reduction in operation. The system designed in HTML, CSS and PHP is interactive, menu-driven and user friendly. It provides timely information about certificates. Most certificates operations are recorded and stored in the computer and retrieved at will. It ensures security as the user must login before and any certificate is added or printed. This chapter gives an overview about the aim, objectives, background and operation environment of the system. Certificate verification system is an application which is generally small or medium in size. 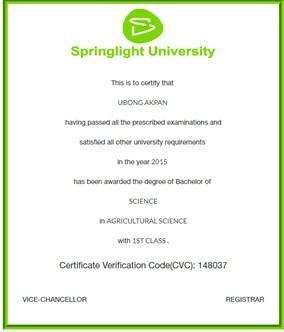 It is used by school management to create and manage the student certificates number using a computerized system where the school can create certificates for the Student, Print certificates for students and more importantly verify a certificate of any student. With this computerized system there will be no hassle and stress to verify any certificate. 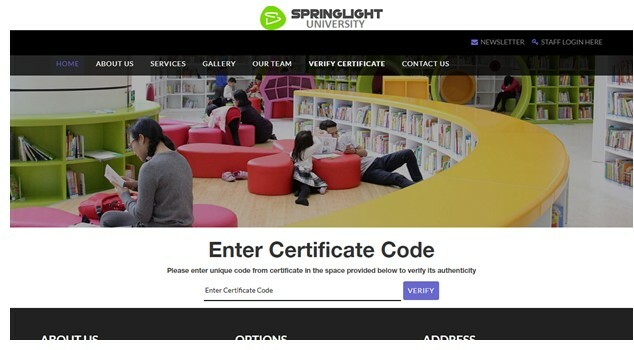 If the user is registrar, the user is able to create and maintain all the certificates of students. All these modules are able to help the Registrar to manage all the student certificates with more convenience and in a more efficient way and it also help in verification of student certificates in an easy and stress-free way. To resolve the issue of manual verification of certificates. To provide a login page where the registrar can have access to register and generate certificate for students. To enable the registrar to automatically generate unique certificate code for each certificate added. To easily confirm the authenticity of any certificate by students and any employer. The problems found during verification of a student certificate was so much that there were cases of employers spending lot of money in order to verify the authenticity of a certificate presented to them during job interviews. Lack of effectiveness in their methods of keeping certificates record, further compounds the problem. The significance of this study was to help and give a benefit to the student, staff, school management and anyone that wants to verify the authenticity of any certificate from the school. The Verification system would improve the monitoring capacities of those who maintain the system. Furthermore, the registrar would be much guided when it comes to adding and generating the certificates of the student, letting them print it promptly and accordingly. This research work will concentrate on Registration, Adding of certificates, Student management, View of all students due to receive certificates, printing certificates. The system also includes handling of some queries like viewing all the student information via S/N, Name of Student, Faculty, department, certificate code and as the case may be. The writer uses MySQL, PHP, HTML, CSS and bootstrap. It is a case Springlight University. Registration: this means to keep records received from the management for reference purposes. Certificate Number(Code): An Assign Numeric data added to each certificate to uniquely identify each certificate. Input: Data entered into a computer for storage or processing. Computer: Computer is an electronic device that accepts data as Input, processes data and gives out information as output to the user. Software:-Software is set of related programs that are designed by the manufacturer to control the hardware and to enable the computer perform a given task. Hardware: - Hardware is a physical part of a computer that can be touched, seen, feel which are been control by the software to perform a given task. Database: - Database is the collection of related data in an organized form. Programming: - programming is a set of coded instruction which the computers understands and obey. Technology: -Technology is the branch of knowledge that deals with the creation and use technical and their interrelation with life, society and the environment, drawing upon such as industrial art, engineering, applied science and pure science. Algorithm : A set of logic rules determined during the design phase of a data matching application. The ‘blueprint’ used to turn logic rules into computer instructions that detail what step to perform in what order. Password: This is a secret code that a user must type into a computer to enable he/she access it or its applications. This is made up of numbers, letters, characters or contribution of any of the above categories. PHP: Hypertext Preprocessor (the name is a recursive acronym) This is a Programming language known as a server-side scripting language. It was used in the developing of this software. Identification: The act of recognizing and naming someone or something. Certificate: A document serving as evidence or as a written testimony, as a status of qualifications, privileges, or the truth of something. Verification: Evidence that establishes or confirms the accuracy or truth of something. Query language: A database query language and report writer allows users to interactively interrogate the database, analyze its data and update it according to the user’s privileges on data. It also controls the security of the database. Angélil-Carter, S. (2000). Stolen Language? Plagiarism in writing. Harlow: Pearson education. Chernin, E. (1988). "The 'Harvard system': a mystery dispelled", British Medical Journal. October 22, 1988, pp. 1062–1063. Laurens, M.E. (2009). Maturation, fecundation, and segmentation of Limax campestris, Binney", Bulletin of the Museum of Comparative Zoology at Harvard College, Volume 6, p. 194. Neville, C. (2007). The Complete Guide to Referencing and Avoiding Plagiarism. Maidenhead: Open University Press.